In these initial days following the marathon, I have been fortunate enough to have also had a slower work week (as in, less night meetings). This has provided me will extra time to indulge myself by engaging in other hobbies that have been long neglected, such as reading. 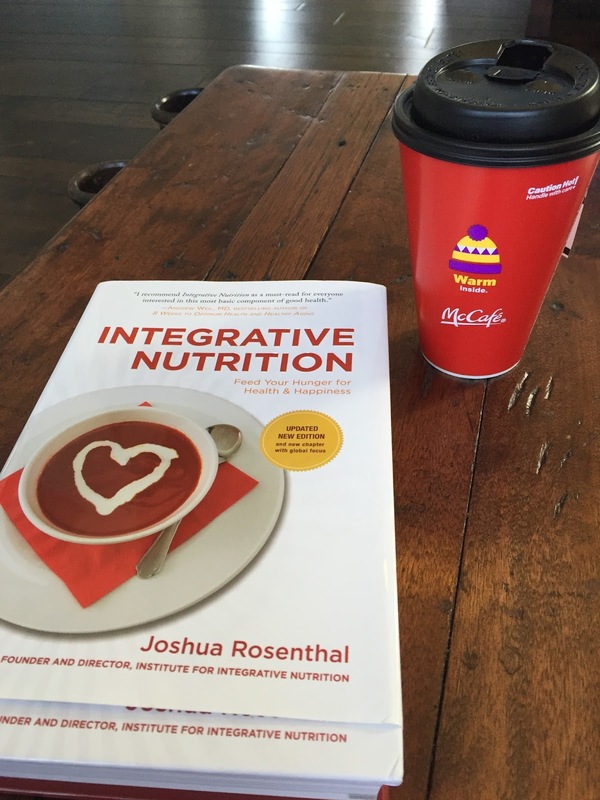 Over the last few days I have started reading the book Integrative Nutrition by Joshua Rosenthal. I came across the book on a whim (it was a coffee table book at the doc’s office that he kindly let me borrow) and it is far from my “typical” reading genre (which, like my TV habits, tends to be more on the guilty pleasure end of the spectrum). I must say that even just a few chapters in, there have been some very useful take-aways. In short, the premise of the book is that eating well is critical to our health and well-being, but there is no one-size-fits-all approach. The book acknowledges the virtues of various diet “trends” (Adkins, Paleo, low-fat, South Beach, etc.) but notes that while all plans may “work” in the short term by virtue of the fact that they inevitably result in the individual paying close attention to their diet, diet is ultimately a very individualized thing. Some people may thrive on a plant based diet, while others may need greater amounts of meat. The key is tracking what you eat and how it makes you feel – making adjustments accordingly. There should be no “rules” and your body’s needs may change on a whim. This is not something we should be ashamed of and we should not become so stuck in our ways that we miss the opportunity to adapt. It’s a simple truth, but it also provided a big “Ah-hah” moment with regard to my running as well (and especially as I am trying to figure out how to recover from this marathon). Admittedly, none of this is new. Nor is it “rocket science.” But it has taken me years, if not decades, as a runner to finally understand these principles…so maybe we are so hung up on finding “rules” to follow that we are blind to these simple truths? 1. There is no one-size-fits-all approach. What does this mean for race training and recovery? First, we have to stop comparing ourselves to others. Most of my friends on social media are also runners, so naturally my newsfeed is bombarded with status updates from friends discussing their latest workouts and training philosophies. While the sharing comes from a place of excitement on their part, it is all to easy to fall into the trap of comparing what you did to what they did (especially if you are training for the same type of race). Along the same lines, “canned” training plans create the same risk. A lot of us are drawn to structure and rules (myself included). While one person may swear by high-mileage training plans, another may need to run less miles and implement more cross-training. 2. Our running needs are fluid – what works at one point in time may not work during another. This may change every few years, every year, or by the day. This lesson has really hit me hard this last year as I have returned to running after my hip surgery. What I “used” to do that brought me much success a few years ago no longer seemed to be the best approach as I was training for this last marathon. I used to be a high-mileage runner with little cross training. Before a marathon, I found that I was strongest with a heavy-taper (running almost no miles the week of the marathon). Now, I have learned that my needs may change on a daily basis. While I still follow a training plan, I also am far more flexible in having a Plan B or a Plan C. I also used to run more miles in less days (taking 2 rest days a week and still hitting 70-80 miles). After having hip surgery, I have found that frequency is important to keep everything loose and moving. Because of that, I now run shorter runs across more days and run almost every day the week of the marathon (albeit, extremely minimal miles). This is also why it is important not to create hard and fast rules for yourself – such as never missing a training day (because it is on the schedule) or never stopping to walk and/or dropping out of a race. This is not to say when things get tough, you should be easy on yourself. Quite the contrary, as running is an extremely mental sport and I fully believe that some of our greatest moments as runners come during those “grit” moments when we are pushing through the pain. My point is – while most of the time pushing through is the right decision, there should be no shame in doing what you have to do to take care of yourself. Running smart can be tougher in some regards than running hard. Learn to listen to your body and to differentiate between these different kinds of pain. 3. You need to take care of your whole self – training is only one aspect. You have followed the plan and done everything “right” with your training – but that is only one part of the equation. I fully believe that taking care of yourself as a whole person (nutritionally, spiritually, relationally, etc.) will help you perform better as an athlete. Even though we may isolate and compartmentalize stress in our head – our bodies don’t always know the difference. That’s why taking care of ourselves on all fronts is so important. Use running as a stress-reliever (it’s great for that) but do what you can to minimize stress in other areas of life as well. Your body will thank you.